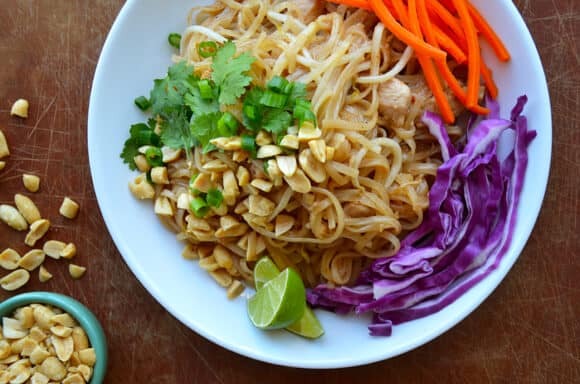 Mastering an easy recipe for pad Thai with chicken at home is both the best and worst culinary discovery to ever happen in my kitchen. I have made this recipe three times in two weeks. I am now a three-time member (and soon to be president) of the Pad Thai Clean Plate Club and am currently accepting all Spanx donations. Pad Thai ranks among my top three all-time favorite takeout dishes (the others being Mongolian Beef and Pineapple Chicken Fried Rice). There’s just something about rice noodles stir-fried with garlic and tossed in a sweet and tangy sauce that inspires me to order this dish time and time again. 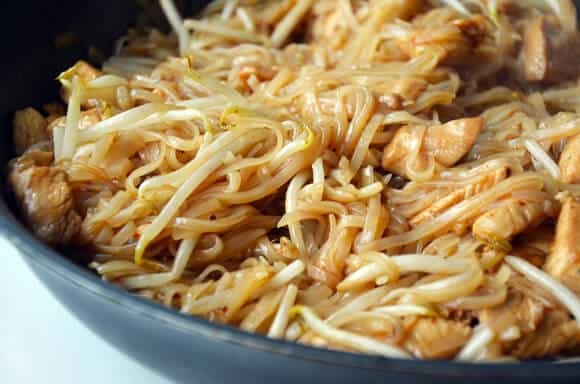 But it wasn’t until I shared a recent Facebook post and Instagram photo that I was inundated with requests to create a DIY version of this popular Thai dish. Challenge accepted! Don’t let the list of ingredients fool you. Five of them are garnishes (read: optional) and the other non-traditional ingredients can be found in most major supermarkets. Just soak the noodles, whisk together the sauce and then stir-fry it all together for the freshest, most flavorful fakeout for takeout. In a medium bowl, whisk together the tamarind concentrate with 1/2 cup warm water. Whisk in the remaining sauce ingredients. Set aside. Fill a large pot with hot water. 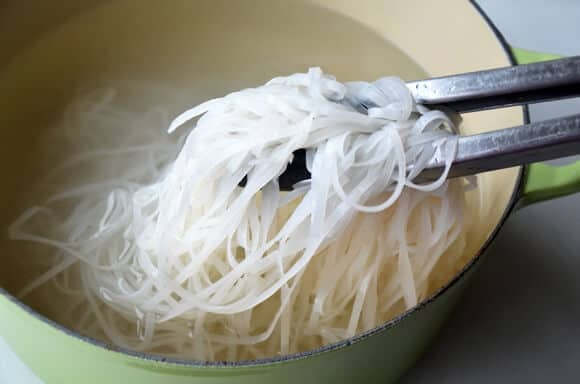 Add the rice noodles and cover the pot, allowing them to soak and soften for 8 to 10 minutes, or until they're barely al dente. (Alternately, cook the noodles according to the package instructions.) The noodles will be stir-fried so do not overcook them at this point. Drain the noodles and rinse them with cold water to prevent them from sticking together. Cut the chicken breasts into thin, 1-inch slices. Place the chicken in a medium bowl. Whisk together the cornstarch with the soy sauce then pour it over the chicken, stirring to coat. Add the noodles to the pan then pour in the prepared sauce. Bring the sauce to a boil, and using two flat spatulas, lift and turn the noodles to combine all of the ingredients. (Don't stir the noodles too vigorously or they'll break.) 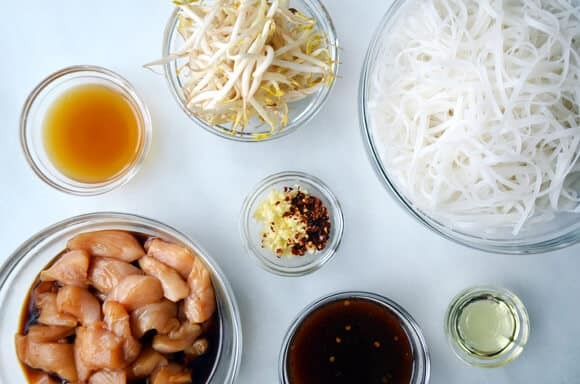 Continue cooking the noodles for 1 to 2 minutes until the sauce thickens slightly, then add the bean sprouts and cook for 1 more minute. The noodles are fully cooked when they are chewy and no longer crunchy. 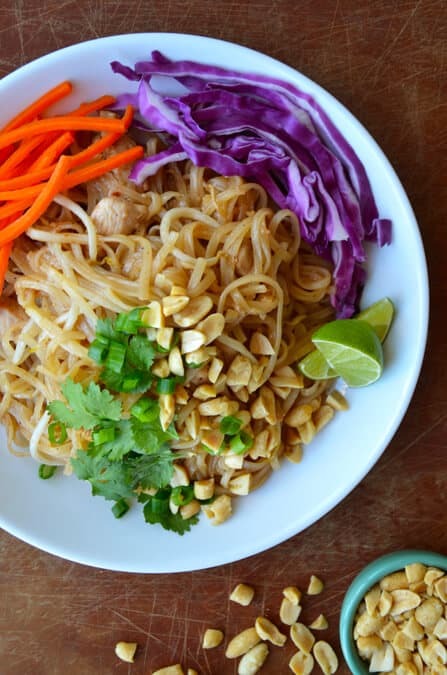 Transfer the noodles to serving dishes and garnish with the sliced carrots, shredded red cabbage, cilantro, scallions, peanuts and lime wedges. A majority of the specialty ingredients in this recipe can be found in the Asian aisle of most supermarkets. My preferred brand of rice noodles is Annie Chun's Pad Thai Noodles. It's important to bring the sauce to a boil so that it will thicken enough as it cooks with the noodles. Make sure you have all of your ingredients prepped and ready to go before you start cooking. This is a fast recipe that comes together in less than 10 minutes once the garlic hits the pan. Recipe by Kelly Senyei of Just a Taste (inspired by Darlene Schmidt). Please do not reprint this recipe without my permission. If you'd like to feature this recipe on your site, please rewrite the method of preparation and link to this post as the original source.